Fulham's superior finishing was the difference as they overcame Stoke to reach the FA Cup fifth round. Vincenzo Montella poached the opener, tapping in at the far post after Tomasz Radzinski had a header saved and then squared the rebound across goal. And Montella turned provider just before the break when he delivered a precise through ball for Brian McBride to volley home clinically. Radzinski sealed the win, slotting in a low shot after a pass from Moritz Volz. Aside from the three goals, there was little action in either box to turn the fixture into a thrilling Cup tie. Stoke, although committed, appeared resigned to their fate and never looked like producing an upset. And Fulham rarely raised the tempo of their game above a canter - mainly because it was not required. The visitors' lack of belief was typified when on-loan Manchester United player Lee Martin wasted his side's best chance early in the second half by firing weakly at keeper Jan Lastuvka. By contrast, Fulham worked four clear scoring opportunities and accepted three of them. McBride was guilty of wasting the first on 10 minutes after comical Stoke defending allowed Liam Rosenior to cross, only for the American to poke wide. However, seconds later Radzinski had a header well saved but reacted first to the rebound and passed across goal for Montella to convert. And when Montella picked out McBride just under half an hour later, the forward made up for his earlier miss with a crisp finish which effectively ended the game as a contest. 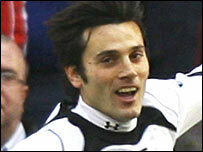 Italian striker Montella, who was making his first start for Fulham, was also involved in the third goal on 54 minutes. He laid the ball off to Volz, who slipped in a pass for the lurking Radzinski to turn and slide his shot into the corner. The defeat could have been even heavier for Stoke had Franck Queudrue's curling free-kick dipped an inch or two lower. But it remained a comprehensive and comfortable win for Fulham and a frustrating afternoon for the Championship opponents. "As well as scoring, he helped make two other goals today and the most important thing after that was to rest him. "Vincenzo has scored goals wherever he has been and everybody knows about him. "He has fitted in very well in the dressing room, the players and the crowd love him." "We gave Fulham a real leg up and it is very disappointing. Once they got the first goal we were struggling really. You can't give them a start. "Fulham have some smashing players and deserved to win but we gave them a helping hand. "And that is a shame because we have a reputation in our league for not conceding goals easily." Fulham: Lastuvka, Rosenior (Davies 65), Christanval, Bocanegra, Queudrue, Routledge, Brown, Volz, Radzinski, McBride (Jensen 77), Montella (Dempsey 61). Subs Not Used: Niemi, Knight. Goals: Montella 11, McBride 39, Radzinski 54. Stoke: Simonsen, Hoefkens, Duberry, Higginbotham, Griffin (Wilkinson 47), Lawrence, Russell, Matteo (Diao 53), Martin, Fuller (Rooney 65), Sidibe. Subs Not Used: Eustace, Pericard.